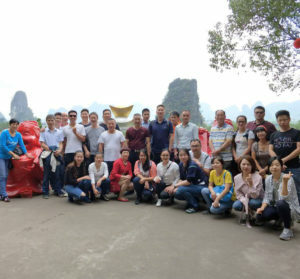 Oct-19 until Oct-22 was Innovate’s annual excursion and this time we found ourselves in YangShuo, one of the most famous tourist attractions in China. Located near Guilin, a famous tourist city of Guangxi Province, Shangshuo is well known for its unique landscape of hills, rivers and caves, as well as distinct culture of the aboriginal people. For 4 days and 3 nights, 30 of us from the extended family of Innovate explored one of the largest karst caves in the world, watched exotic group dancing by local people, indulged ourselves to the famous local cuisines like beer fish and beer duck, took rafting in crystal creeks and visited the famous 20 RMB note scenic spot in the Li river by boat. At night falls we unleashed ourselves in the West street, famous for its exotic restaurants, bars and taverns and watched the famous Impression Liu San Jie show designed by Zhang YI Mou, one of most famous movie directors in China, what Yangshuo has to offer! The company trip has strengthened our ties to the company and also to our family. Together we made a good team at innovate!